Let me start my very first post by saying that I'm by no means a vegetarian. I call myself Veggie Girl because lately I've made a conscious decision to eat mostly vegetables. By mostly, I mean 90% of my diet is vegetarian. I still cook meals with meat in it about twice a week because of my carnivorous family so my 10% meat diet comes into play when I feel too lazy to cook a separate meal for myself on meat nights. I must say that given my new goal of eating mostly veggies, my family have been very obliging and for that I'm grateful. Anyway, on to the post. It's a food review of some veggie dumplings that I chanced upon at the Asian grocery store a few weeks ago. 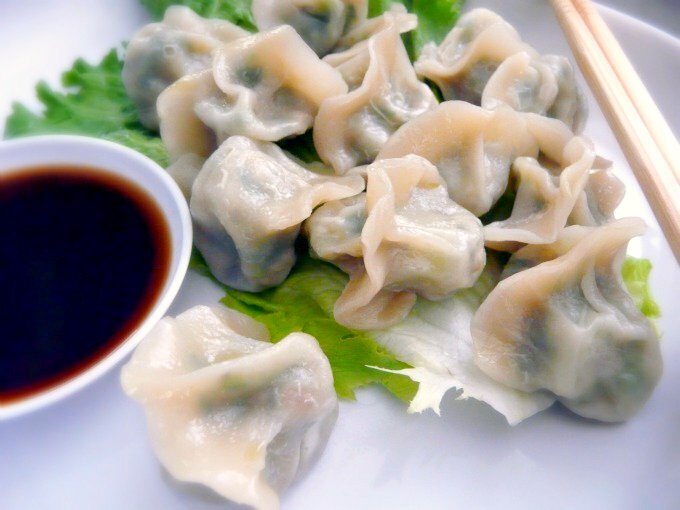 If you've been to an Asian grocery store, you'll see that they have an astounding variety of frozen dumplings, also calling jiaozi in Mandarin. What I didn't realize was that all of them contained meat. I had almost given up hope of finding veggie only dumplings when I saw a SALE sign advertising two bags for $3.00. Considering most bags of dumplings are around $4 to $5, I thought it was an excellent deal. When I looked at the bag closer, I discovered, lo and behold, they were meatless! I grabbed Five-vegetable and the Shanghai Bok Choy dumplings to try but went back the following week to grab the other two flavors. 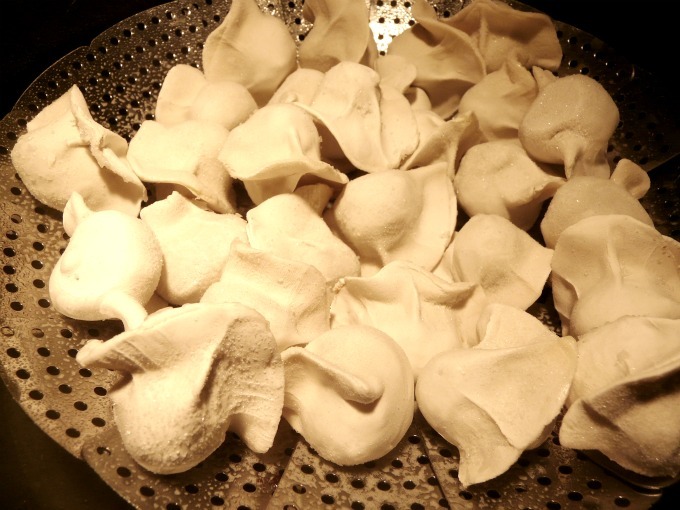 Synear was the official and exclusive dumpling supplier to the 2008 Olympic Game participants in Beijing. Wow, dumplings fit for athletes! They must be really healthy right? Not entirely. For one, they contain MSG, but then again that should come as no surprise since most store bought frozen dumplings contain MSG. Also, according to their packaging, about 15 little dumplings contain 15g of fat, 3g of it being Saturated. Considering they're meatless, their fat content is pretty high so I assume it's attributed to the amount of oil in them. Filling: shanghai bok choy, shitaki mushrooms, peanut oil, sesame oil, soya sheet (soybean, water), salt, monosodium glutamate, sugar, ginger. 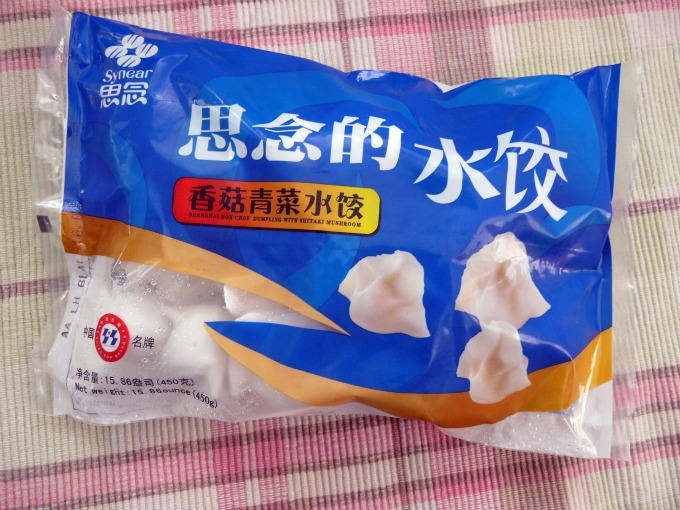 According to the packaging, the dumplings could be cooked by boiling, steaming, deep frying and pan frying. I tried out all methods except for deep frying and the most successful method by far was steaming. I'm not sure why they said it would be ok to boil them because they plainly fell apart in the water which caused all of the filling to escape. If you're into dumpling filling soup, this method might be for you. It ain't for me. Pan frying them yielded somewhat tough dumplings which I didn't care for either. But when they were steamed, it was an entirely different experience. They became delicately chewy and all the flavors seemed more enhanced. Serve them up with some ponzu sauce and you're good to go. Pro tip: Spray the steamer basket and the frozen dumplings with some non-stick spray to prevent them from sticking to each other and to the basket. Trust me, I learned that the hard way. Frozen dumplings ready for a good steaming! My favorite one by far is the Shanghai Bok Choy with Shitake Mushroom version. The chives version is my least favorite mostly because the flavor of the chives was too overpowering for me. The celery version is just mediocre as was the five-vegetable which contained frozen mixed vegetables. 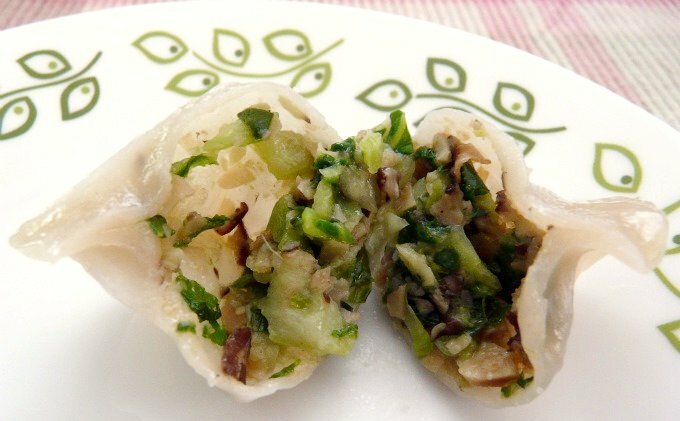 The Shanghai Boy Choy version was soft and chewy, with a burst of shitake mushroom flavor and a hint of ginger. Nothing about it was overpowering and I felt that the flavors were well balanced. They were also not greasy at all. 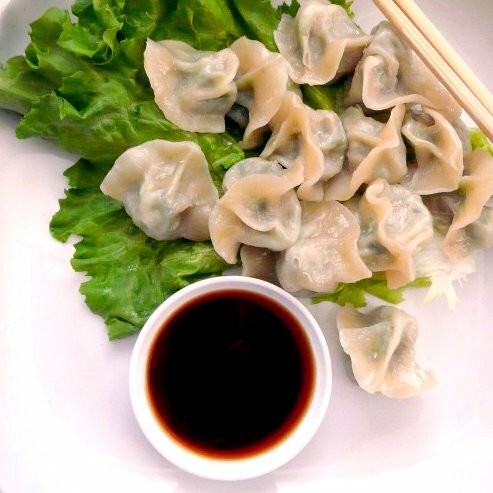 Overall, they are tasty dumplings!